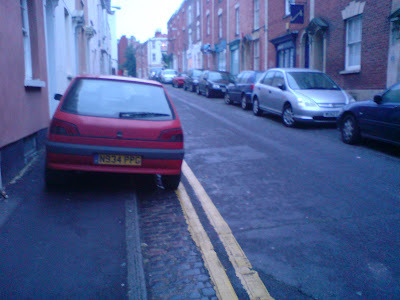 Too tired to hunt for a parking spot but too conscientious to park ona double yellow? By parking entirely to the left of the yellow lines,this car has found a clever solution to a common urban problem -- I mean, it's not actually *on* the yellow lines, is it? Even better, the pavement on the other side is filled with cars and wheelie bins, so pedestrians can at last enjoy the thrill of an open road. Go on and reclaim the streets - do it in the road!